The Australian Cattle Dog, also known as the Blue Heeler, is a sturdy, compact working dog, powerfully muscled, yet very agile. 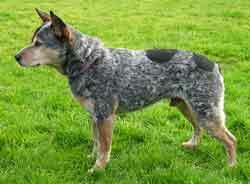 They were bred from a mixture of smooth, blue speckled Collies, wild Australian Dingoes. Australian Kelpies, Dalmatians, and Bull Terriers. The result was a strong, compact, symmetrically built herding dog, with few equals. Heelers are always alert, intelligent, watchful and courageous which makes them an ideal guardian for the rancher, his cattle and his property. 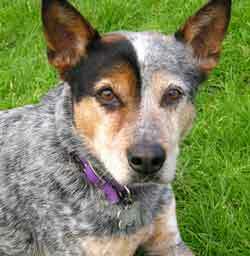 Heelers have a weather resistant coat with a short, coarse, straight outer coat and a short dense undercoat. Color should be a uniform red speckle all over or blue, blue-mottled or blue-speckled. The dog may have a mask surrounding the eyes and may also carry tan markings on the forelegs, the jaws and the hindquarters. Eye color is dark brown. The Australian Cattle Dog is a very active, intelligent breed which can become easily bored, leading to serious behavior problems. A medium-sized dog, the males weigh 35 to 45 pounds and are 18-20 inches at the withers. The slightly smaller females weigh 30 to 40 pounds and stand 17-19 inches.